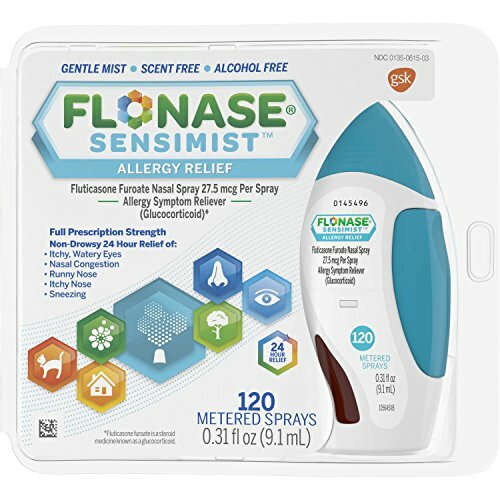 Once-daily Flonase Sensimist is an allergy relief spray that helps block 6 key allergic substances, including histamine, prostaglandins, cytokines, tryptases, chemokines and leukotrienes. Most allergy pills only block histamine. * Utilizing patented MistPro Technology, Flonase Sensimist delivers powerful, more complete allergy relief** in a fine, gentle mist you will barely feel. It works directly at the source to help provide 24-hour relief of nasal congestion and itchy, watery eyes.† Plus, Flonase Sensimist is scent-free, alcohol-free and virtually drip-free. Be greater than your allergies and try Flonase Sensimist Allergy Relief today. *Mechanism versus most over the counter allergy pills. Flonase Sensimist nasal spray acts on multiple key inflammatory substances (histamine, prostaglandins, cytokines, tryptases, chemokines and leukotrienes). The exact number and precise mechanism are unknown. **versus single ingredient antihistamines that do not treat nasal congestion. †Flonase Sensimist is indicated for itchy, watery eyes in adults and children 12 years of age and older. If you have any questions about this product by Flonase, contact us by completing and submitting the form below. If you are looking for a specif part number, please include it with your message.